Soil Acidity and Plant Growth emerged from concerns over increasing acidification of soils under improved pastures over wide areas of southern Australia. 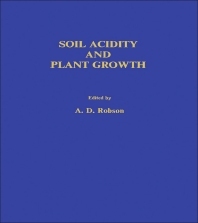 While the book has its origin in the problems of acidification of Australian soils under pastures, the authors examine soil acidity within a much broader framework, making their views relevant to all agricultural and natural ecosystems on acid soils. The book's first two chapters discuss the chemistry of soil acidity and the ecological processes leading to it. This is followed by separate chapters on biological responses to soil acidity, covering mineralization of soil nitrogen, incidence of plant diseases, plant mycorrhizal associations, symbiotic nitrogen fixation in legumes, and genetic variability in plant response to toxicities. The remaining chapters focus on the correction of soil acidity problems by liming. These include studies on the rates of application and effectiveness of liming materials; and the development and use of computer modelling procedures to help researchers identify the effects and interactions of soil pH on component processes and to provide assistance to farmers in the management of long-term subterranean clover pastures.